Bosch is launching what they are calling a store within a store at select Home Depot Stores. This new Bosch store inside of The Home Depot is called the Bosch ProCenter, and is likely an area set aside just for Bosch tools. Also on hand at the Bosch ProCenter will be a Certified Expert to help answer any questions you might have about Bosch tools, and give tool demonstrations. Sounds like what Hilti did. Right now the Bosch ProCenter can only be found at a few Home Depot stores in the Chicago, Houston, and Miami areas, and there is no word on expanding to other states. 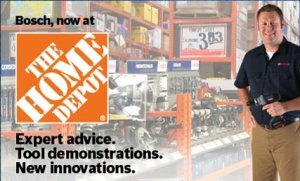 To kick of the new Bosch ProCenter, select South Florida Home Depot Stores with Bosch ProCenter will be hosting the Bosch Blitz Team, who will offering special promotions and giveaways. One event that sounds like a lot of fun is the Bosch Power Box Toss Challenge, where winners will receive a new PB360S Power Box Jobsite Digital Media Stereo. Dates and locations below. Monday, January 10, 2011, from 7:00 a.m. to 2:00 p.m.
Tuesday, January 11, 2011, from 7:00 a.m. to 2:00 p.m.
Wednesday, January 12, 2011, from 7:00 a.m. to 2:00 p.m.